FSU's press release is below. See here for the latest media coverage on the cuts. BOSTON — The University of Massachusetts Boston may cut up to 400 teaching positions by next semester, a move that faculty members say could devastate programs and make it more difficult for students to graduate on time. Last week, the UMass Boston administration notified approximately 400 faculty members —one-third of the faculty — that their appointments as lecturers “will terminate as of 8/31/2016 and not be renewed.” The move “supersedes any previous offers of Fall 2016 courses,” the notification stated. The staff reduction was announced despite the fact that student enrollment is rising at UMass Boston. Cutting teaching positions means that students will find some courses no longer being offered — and increased class sizes in those courses being retained. Under such a scenario, UMass Boston students may need to spend an extra semester, or year, to complete their degrees. As a commuter university where many students are balancing families, full-time jobs and other responsibilities, a decision to cut hundreds of positions erects undue obstacles to timely graduation for students struggling to complete their degrees. Larger class sizes make it difficult for instructors to provide students with individualized feedback and build mentoring relationships — key factors for success among first-generation college students. Faculty, staff and students have come together to urge University of Massachusetts President Marty Meehan, the UMass Board of Trustees, the UMass Boston administration, state legislators and Governor Charlie Baker to reevaluate cuts and instead guarantee fully sufficient funding for public higher education. Any plan to increase costs for students or that compromises the educational mission of UMass Boston is not acceptable. 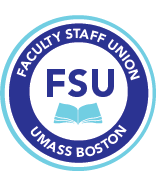 The Faculty Staff Union looks forward to open conversations with the campus leadership to advocate for sufficient funding, ensuring that UMass Boston continues its upward trajectory while maintaining its core mission. Representatives of the UMass Boston community will be attending the University of Massachusetts Board of Trustees meeting on June 15.